I feel indeed honored to be invited to present some of the things I do with Problem Solving in Mathematics at the NCTM 2008 Illuminations Institute. This web site will attempt to link you to the many problem sets, papers, and discussions on my web site at the University of Georgia. I will make links to the specific problems I am discussing here but in most case the RETURN to this web page will need to be done with the 'back' key on your browser rather that the Return link on the particular problem page. 1. 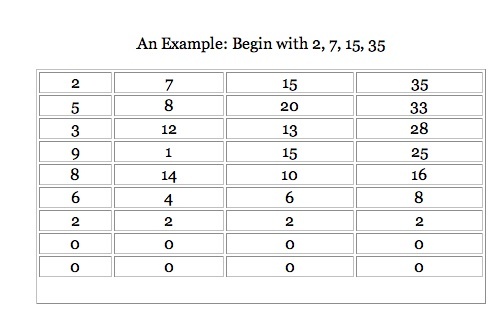 Place any four numbers you choose in the first row of an array. 2. In the second row, in the first three columns write the difference of the two numbers just above and to the right in the first row (the larger minus the smaller). In the fourth column write the difference of the number above and the one in the first column of that row (again the larger minus the smaller). In otherwords, each entry is the absolute value of the difference of the two terms in the previous row. 3. Repeat for each row, in terms of the numbers in the row just above. Implement it on a spreadsheet. 4. Will every choice of four number you begin with eventually lead to rows of zeros? 5. Challenge: Find four begining numbers that let you generate more than 10 rows with non-zero values. More than 20? a. What is the value of such a problem? d. Try it with 2 columns (trivial), 3 columns, 6 columns. Appears to go to a row of zeros for even number of columns and oscillates a row of zeros and ones for odd number. No proof. e. If the four numbers are related by a function f(x), for some functions the number of non-zero rows can spike very high for a very narrow range of x values. B. Angle Bisectors of a 120 degree Obtuse Triangle. Let angle A of triangle ABC have measure 120 degrees. B, and C' is the intersection of AB and the angle bisector of angle C.
Prove angle B'A'C' is always a right angle. C. Dissect a square into a set of acute triangles? How many triangles? Any number, but then, what is the minimum number of acute triangles that can be used to disect a square? Okay, what does 'dissect' mean? My Problem Solving Course. EMAT 6600 Mathematics Problem Solving has been a course for prospective and inservice teachers since about 1969. I am not the only person who teaches the course but his web page has course information, the syllabus, and problem sets around which we organize our discusssions. Each Problem is presented with minimum presentation and discussion for students to begin explorations. Sometimes there is a link to a HINT, which may or may not be useful. Very seldom do I present a link to a complete solution. In some cases the page presents a set of related problems. When I teach the problem solving course, it is organized around discussions of these problems or others that may come up in our discussions. Each student prepares a 'Resource' which serves as a portfolio of their work. This is usually a Notebook of problems, with solutions, attempts at solutions, notes on adaptations of the problems, etc. The course is about being immersed in mathematics problem solving. There is very little discussion of any philosophy or theory of problem solving. We are 'doing' problem solving, not just talking about it. My Course on Mathematics with Technology. The EMAT 6680 course, as I offer it, is organized around sets of open-ended explorations of mathematics problem situations using technology. We use readily available software such as Geometers Sketchpad 4.06, Graphing Calculator 3.5 (also known as NuCalc), Spreadsheet, handheld devices, and our wits. The course is organized into 13 "Assignments" -- each worth about a week's work of a variety of explorations. For 12 of the Assignments, each student selects an exploration and constructs a write-up. Those write-ups constitute an electronic portfolio of the student's work. All of the student web pages for the past several years are there -- the very good, the good, the bad, and the ugly. Project InterMath. Project InterMath was funded by the National Science Foundation around 1998 or 1999. It was a collaboration among the Department of Mathematics Education and the Learning and Performance Support Laboratory at the University of Georgia and the CEISMC Center at Georgia Institute of Technology. The purpose was to develop an internet based set of materials for use in instruction with inservice middle school mathematics teachers in order to improve their content knowledge of mathematics and to allow them to develop facility with technology tools. Sets of open-ended explorations in the areas of Number and Numeration, Algebra, Geometry, and Statistics were developed. Over the years many 45 hour workshops and courses have been taught, and continue to be taught, using these materials. Each instructor organizes a syllabus and selects the the items for investiation from the InterMath web site. Even though the NSF support for this project ended in 2004, it continues to be widely used and the web site receives over 300 hits per day. This is a problem from Schoenfeld. I think it is most interesting in the challenge to fine 5 or more different solutions. The AM-GM inequality is a powerful tool for examing minimization and maximization problems with algebra or geometry. It is not well understood by most teachers and does not make its way into school curriculum enough. Consider the area of various shapes having a fixed perimeter. 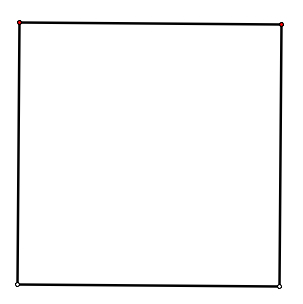 Of all rectangles with a fixed area, the maximum area occurs when the rectangle is a square. The maximum area of all triangles with a fixed perimeter is for the equilateral triangle. Of n-sided polygons with a fixed perimeter, the maximum area occurs when the polygon is regular. Area of a Sector of a Circle. Find the sector of a circle with a fixed perimeter (i.e. two radii and the arc) that has maximum area. Shape of a can with minimum surface area given a fixed volume. Assignment 0 -- Investigations 8, 9, 10, and 11. Assignment 3 -- Investigations 2 and 3.